Karl Hans Welz invented the generator of life force (Orgone Generator®, Chi Generator® or Prana Generator®) the first device on the planet that actually generates life force in 1991. A few months later he invented orgonite®, a very effective material to accumulate life force (chi, orgone, prana, mana). The Tarot deck has 78 cards. Each card has a specific meaning. The Tarot deck has 22 major arcana and 4 suits of minor arcana. The major arcana represents universal energies, or universal ideas. The four sets of minor arcana represent energies that are more specific. These energies relate to the four elements of fire, water, air, and earth. The books by Eden Gray are very good introductions into the understanding of the tarot cards. For the more advanced person I suggest the book "The Tarot of the Bohemians" by Papus. Of course you can use any tarot deck you like. The purpose of this page is to give you a series of tarot spells that you can adjust to many situations of magical work. In the following, you will find the abbreviations that we are going to use in the descriptions of all spells on this page. 1 is for Ace, two for the two etc. 2 cp. = Two of cups. Kn. SW = Knight of Swords. 1 pt = Ace of Pentacles. 10 WD = Ten of Wands. An ancient tool to do your work! Anexcellent method to read the tarot cards is the Keltic Cross Method. The same method gives you a means of setting up a spell. This is like the reversal of the energy flow, i.e., with the same method that you can use to tune into a person you can now direct trends toward specific results towards the same person. By now it is obvious how you have to lay out a tarot spell. You may or may not use all positions of the Keltic Cross. The simplest way would be to set the target person and the final outcome. However, when using all positions you certainly can refine the spell, speed up the result and make the whole setup more effective. Experience in reading the tarot cards with this method is an advantage, but not a must. Again I suggest that you get a goot tarot book (any of the books by Eden Gray) and start your studies. This is especially necessary if you do not know exactly the meanings of the tarot cards in their upright and reversed positions. Following the diagram above you can lay out your tarot cards together with the structural link to the target person (which may be you) and trigger any tarot spell of your desire. You can set up an workplace (an "altar") following magickal traditions or simply lay out the tarot cards, set a candle with them, charge the layout with life force and mentally send the energy to its destination. Naturally you can use the same layout for any trend links. In other words: if you do not know the meanings of tarot cards sufficiently, you may use any other symbol of your choice from grimoires, religious symbolisms, spiritual symbolisms, etc., including symbols that you create for yourself. A significant help for the Keltic Cross Setup or the Tree of Life Setup is the Radionic Program for Tarot Spells on CD (for PC). 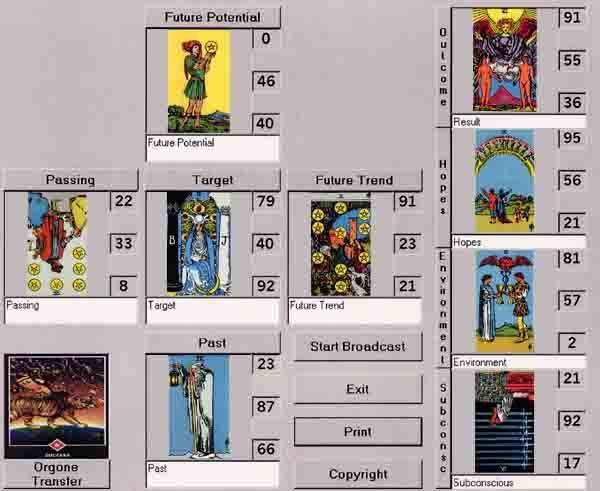 Simply set the pictures of the cards in the desired positions, connect with a source of life force such as a a candle or, better, an orgone generator, and run it. Use the white areas (Target, Passing, etc.) to specify more in detail what the tarot card should do. The numbers are radionic rates, to ensure proper connection of the cards with your specifications. This program comes with a full set of Tarot Cards in their upright and reversed positions, more than 500 other magickal symbols, plus additional instructions. Order from: HSCTI, P.O. Box 1298, Woodstock, GA 30076. Checks or Money orders to: HSCTI. Phone: (770) 924 0223 Fax: 770 924 0223 - call before faxing. Copyright© 1994 by Karl Hans Welz.